This person, then, has experienced great Material Success, and has much Wealth. They did not inherit it all; they are not spoiled heirs or heiresses. They earned it through their Industrious behavior and their Competence. They are Capable andEnduring; they won’t give up until they have succeeded. They are the fire that never goes out, and the landslide that does not stop until it has reached its destination. They are dedicated to Laboring for gain, and are sometimes overly (or at least extremely) Materialistic. They can be very Patient; these are the people who can work there way up to great wealth from nothing through hard work and never-ending patience. They do not rise up quickly, but they do rise; they prefer Slow Growth to a meteoric rise, arriving unobtrusively at the site of power. They can sometimes be of Low Intellect, knowing only how to make gains; they may be exceedingly Narrow-Minded or only able to do things by the book. They Look Ahead and Consolidate Their Gains as they move forward, as they are very Cautious. They have Little Initiative and prefer to take the tried-and-true path to gain as opposed to taking risks. However, if the risk is not too extreme and promises great gains, they are often willing to take that chance, for no man who earned his own fortune got there without taking any risks; it’s a matter of taking carefully calculated risks. 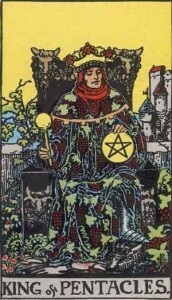 The Rider-Waite art shows a man sitting on a throne surrounded by impenetrable stone and lots of green plant life, his robe colored with images of green leaves. He has gotten to where he is through slow growth, like the mighty tree, saving up a little every day. He owns a large castle seen in the background, and is calm and secure in himself and his future. He is the younger version of the man we saw in the Ten of Disks: Wealth. The Thoth art shows a man on a still horse, looking offahead into the distance, pausing to rest and plan his path carefully. While he looks one way, his horse looks the other way, keeping them both safe, emphasizing caution. His weapon is a club; he uses brute force to get his way, as opposed to trickery or more subtle plays, like a sword would require.